Dr. Cheonil Park is a board certified chiropractor in the state of New Jersey and New York. He received his doctorate of chiropractic degree from New York Chiropractic College. As a BioPhysics® practitioner, Dr. Park has a vast amount of knowledge in human biomechanics, nutritional, rehabilitation exercises and ergonomics. He also has advanced knowledge in structural dysfunctions of the spine in relationship to our nervous system and functions of the body. 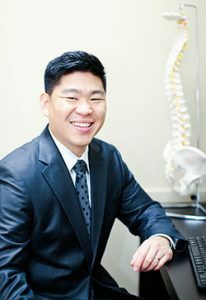 Dr. Park believes that chiropractic profession needs to provide valuable and reliable health information to the public and help every people to be aware of what ideal spine can do to their health. He loves to train HARD, serve BIG, love LARGE, and live OUT LOUD.